Learn how to meet the security requirements for your E/E automotive solution with improved security. Did you know that automotive security best practices indicate that all safety-critical E/E systems are also cybersecurity critical? An automotive E/E solution that does not protect from an adversarial action can not be considered state-of-the-art. Breached security of a safety-critical component leads to potential liability and may result in a costly delay in production because you cannot meet your functional safety requirements any longer. 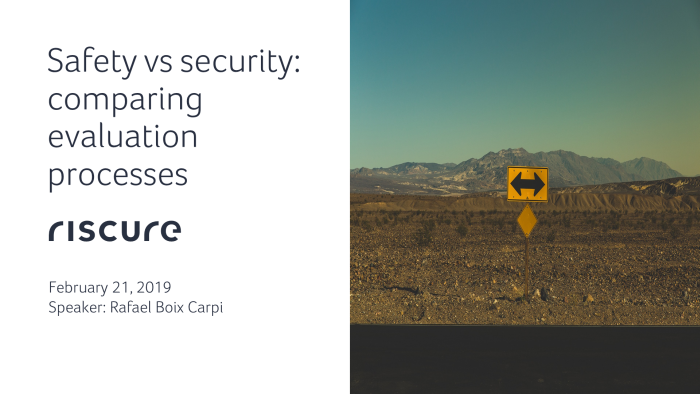 Based on years of experience developing and certifying secure devices and software across various industries, Riscure has created a dedicated interactive Automotive Security Training. Part 1: Fast track your security. Adding security to a product is expensive. Some costs can be easily quantified, while others are revealed in the process. Learn about the typical lifespan of software and hardware solutions, the importance of testing and how you can reduce costs. Part 2: Security Requirements Engineering. Save time and avoid common pitfalls by writing technical solutions that meet OEM security requirements. Part 3: Secure code development. Dive into the economics of secure coding and learn about the shortcomings of secure coding guidelines. Upon successful completion of the training you and your development team will be better able to meet upcoming industry-standard requirements for Cybersecurity and Functional Safety, delivering the right security at a reasonable cost. Interested in what our automotive customers are saying about us? The course consists of three modules. You can choose to attend a single one, although we recommend attending all of them. This course consists of three parts: an instructor-led learning session, time for completing assignments and self-study, and a live Q&A session. The learning and Q&A sessions will be recorded and can be watched anytime after the official broadcast date. If your job means you are responsible for at least two requirements from the below list, then you are a perfect candidate for the training. Contact us to learn more. Interface with stakeholders to understand requirements, domains, viable technologies for solution development. Advise or manage a project team on key issues of functional safety particularly in requirements engineering, in software design and architecture development activities. Create, maintain and refine all documents relating to security topics such as: security plans, security objectives and requirements, functional architecture, requirements for hardware and software for automotive ECU development projects. Identify risks, quality issues, business opportunities, estimate effort, analyze requirements and establish priorities. Define architectural requirements and align them internally or as an OEM or with your customer. Our training philosophy is centered around collaboration. We are committed to working together with you in order to mitigate and prevent weaknesses in your products and services. We help you learn the basics of attacks and defenses in an immersive, hands-on approach, and enable you to practice until you master newly acquired skills and knowledge. Our team consists of both automotive and security experts. We support you throughout the entire development life cycle. Fill out the form below to register to attend this course. We will contact you after registration to finalize details of payment and invoicing. You will then receive your learner access to our online portal. Each course part is available for purchase individually, or you can choose to buy the entire training. Thank you! Our sales team will get in touch with you shortly. To help you learn more about the course contents, we have two free webinar recordings available for you anytime. Security, the new safety requirement in automotive. Watch the recorded webinar. Automotive safety vs. security: comparing the evaluation processes. Watch the recorded webinar. Also check out Riscure’s publications in the field of automotive security.